THE next set of opportunities for banks as they go further down the digital path is in tapping people’s “slow money” needs, according to Cognizant, a US-based global professional services group. “Right now, the hot areas [in digital] are in wallets and payments. But for how long can you continue to focus on that? You have to move beyond mobile wallets and payments, and that’s where I think the next set of opportunities are going to be — addressing the slow money needs of people, which is definitely missing right now,” says Manish Bahl, a senior director who leads Cognizant’s Center for the Future of Work in Asia-Pacific. 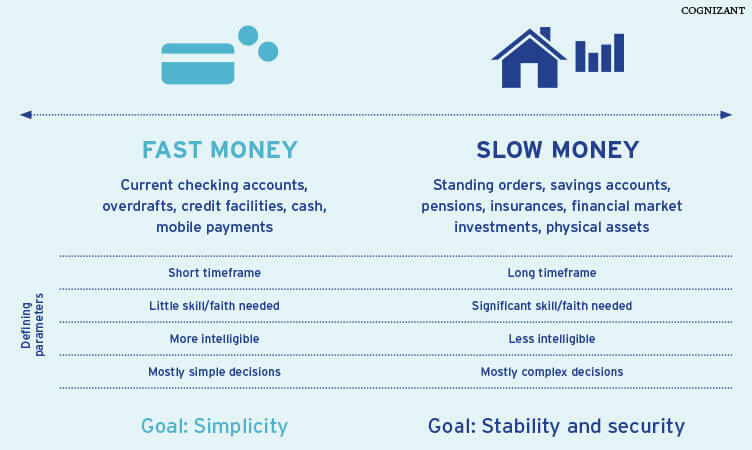 “Slow money”, a phrase coined by Cognizant and its partner ReD Associates in a recent study, refers to any future spending or saving by consumers, and this can include pension, insurance and financial market investments. This is opposed to “fast money”, which refers to their daily and short-term spending and can include current accounts, credit facilities, cash and overdrafts. The results of that study, which was published by Cognizant and looks at people’s emotional relationship to money, show that banks need to better understand their customers’ relationship to money and focus on where those needs are not being met. It estimates that banks can achieve a financial impact corresponding to an increase of 14.2% of revenue by getting the slow-money challenge right. “Until now, digital innovation and fintechs have largely focused on solving problems related to people’s fast money. While digitisation has delivered many benefits for customers and companies, it hasn’t resulted in the strong customer relationships necessary for winning in the future. In contrast, our study demonstrates that getting slow money right will make consumers more loyal, less price sensitive and more inclined to do more business with your organisation. That’s why we believe that resolving people’s slow-money challenges is the next digital imperative in financial services,” reads an excerpt from the study. The study, conducted over five months in 2016 and 2017, comprised an ethnographic look into 32 families and their social networks in the US, UK and Germany, as well as a survey of 3,000 people in the US and UK to test the insights from the ethnographic study. It also included in-depth conversations with financial institutions and fintech entrepreneurs. In relating this to banks in Malaysia, Manish notes that almost every bank here has already formed some kind of collaborative approach with fintechs. “Right now, the focus is very much on payments and wallets, both from fintechs as well as banks. But over the next three to five years, I believe banks need to start focusing on the long-term financial objectives of people, which mean pensions, investments and so on. These are opportunities that are sort of overlooked by many banks and fintech companies in the country,” he says. “Right now, the relationship that people have with banks is more transactional … and that has been the case for so many decades and there’s nothing wrong with it. But now, with fintechs coming into the picture, thing are going to get changed a lot, which means establishing a deep-rooted customer relationship that is going to be critical to succeed in digital,” he adds. Manish was speaking to The Edge in Kuala Lumpur, where he was a speaker at the Asian Institute of Chartered Bankers’ global banking discourse series, “Mastering the Application of Digital Thinking and Technology in Banks”, last month. He cites Google, Amazon and Facebook as examples of companies that have developed a deep connection with people. “Whether we like it or not, they have developed a deep connect. Why? Because we feel that they understand us, and they provide or tailor-make their services based on what we are sharing online. I’m not saying that banks need to become like the Amazons of the world, but there are some interesting lessons that we can learn from these companies,” he remarks. Manish is convinced, however, that things are shaping up and that over the next three to five years, there will be a “rapid explosion” in terms of innovation and investments that will take place in Malaysia. Banks in Asia-Pacific are at different stages of their digital journey, with digital laggards and digital leaders, says Manish. What differentiates the two is whether they are just “doing digital” or actually “being” digital. Being digital, he explains, means going beyond revamping the bank’s website or tweaking existing services and rebranding them as digital. It means injecting digital into the very core of what the banks do and how they interact and transact with customers. “What we have seen is that companies that are applying digital to the core, you know, changing their business model, are definitely growing much faster compared with companies that are slow (in doing so),” he says. Manish says Singapore’s DBS Group is an example of a bank that is being “digital to the core”, having launched a bank without branches, digibank, in India, the country’s first mobile-only bank. “They did it all in nine months … so, in nine months, they had a bank ready to compete with traditional peers in the market. That’s the speed of change that DBS brought to the country. And obviously, their customer base is growing like anything … because they’re passing all these savings of opening a physical branch to customers with a high rate of interests on their savings accounts. So definitely, it’s a win-win proposition for both customers and the bank,” he says. He singles out China as leading the pack in Asia, by far, on the digital curve, having come out with the most innovative products and services. But how does Malaysia fare on that curve? “China’s a different story — it’s not an apple-for-apple comparison — and I don’t think we should be comparing against China, frankly. It (Malaysia) is a very protective market and obviously, banks are quite advanced — they’re providing all the digital channels to consumers, so things are moving at a gradual pace. But yes, there is always room for improvement. We can do things much faster and we can do it at a much faster speed, no doubt about it. They can do more, especially on the execution and on the infrastructure-readiness part. But, I think they are on the right path. “On the regulations front, maybe a little bit more flexibility is going to help banks move up the digital curve much, much quicker. But, like any regulator across the world, obviously regulators here have their own [considerations] they need to fulfil. But, to me, I think the Malaysian banks are doing fine,” he says.